The original Overcooked! was a surprisingly great co-op cooking game, allowing 2-4 local players to team up and bake lots of dishes in a desperate attempt to save the world. 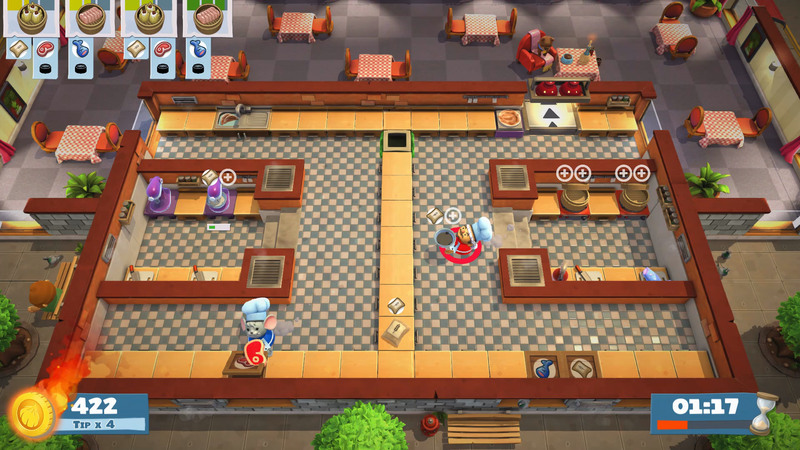 Now Ghost Town Games and Team17 have whipped up Overcooked! 2, which adds both online co-op and competitive play to the recipe. As you might expect, the result is a devastatingly delicious cooking adventure. Seeing as how the first Overcooked! opened with the amazingly dramatic scene of a gigantic monster on the verge of destroying the world, it would be tough to top that scenario in the sequel. Overcooked! 2 instead begins with the Onion King and his faithful dog Kevin attempting to prepare a recipe from the NecroNomNomicon. 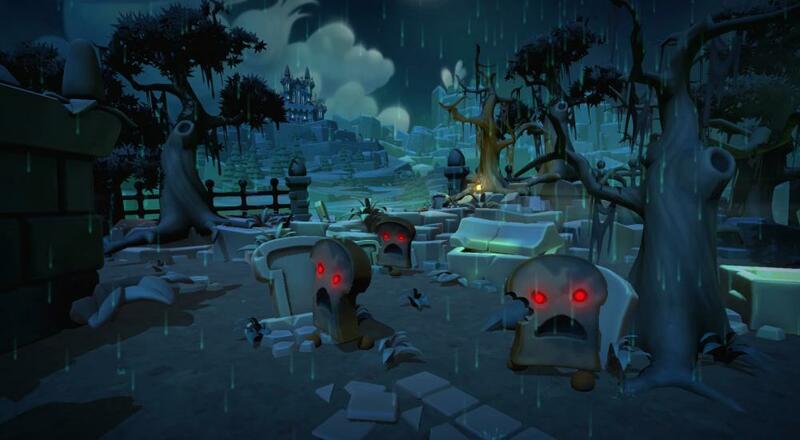 Naturally, things go awry, resulting in the creation of an evil army of Unbread zombies. Now our heroic squad of chefs must travel the world to find recipes that will satisfy the Unbread once and for all. It’s a delightfully silly setup for a fun and frantic cooperative adventure. Overcooked! 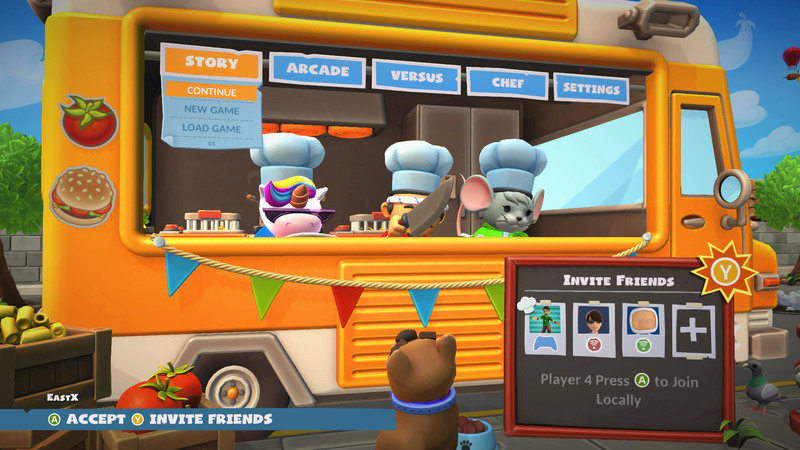 2 features a new-and-improved main menu from which players can select their chefs, party up, and choose between three different game modes (Story, Arcade, and Versus). You start with several cutesy chefs in your playable roster, all with identical abilities. More will unlock through campaign progress, with an additional batch that were offered as a preorder bonus now available for purchase as well. Story is Overcooked! 2’s primary mode, a campaign made up of dozens of levels spread across a huge map. As our heroes complete batches of levels, they’ll have to drive their food truck back to the Onion King’s castle to progress the story and unlock the next batch of levels. Accomplishing secret (usually very easy) conditions on specific levels will unlock extra tough hidden levels as well. The core gameplay remains mostly the same as in the original. Each level requires two or more chefs to cook food for various customers, not unlike a time management game. If playing solo, you’ll have to switch between two chefs to make everyone’s orders. The game can still be enjoyable that way, but it’s obviously built with cooperation in mind. That co-op focus is better than ever now that both local and online co-op are supported. Cooking is simple in concept here – you just need to grab the ingredients for the desired recipe, chop or cook them if needed, put it all together, and serve it. The recipes get slightly more complex as the game goes on, but the game rolls them out naturally so as not to overwhelm players. Time is always of the essence, so you’ll want to dash around to speed things up. Players can now toss uncooked ingredients to each other (or just onto floors and tables). This saves a little time, but the levels are built with tossing in mind, so the game hasn’t gotten easier. In fact, Overcooked! 2 gets more and more hectic as you progress through the campaign. Levels start to include moving obstacles or platforms that limit access to portions of the level. These gimmicks can be amusing, up to a point. But annoyingly, when cutting boards and other tables move in certain levels, you can’t use, place, or pick things up from them until they finish moving. It’s also too easy to fall off edges, causing fallen players to lose time as they wait to respawn. Playing with other chefs is the best way to experience Overcooked! 2, and you have lots of options for how to do it. Two players can share one controller in hand-cramping fashion, just as in the first game. For people with multiple controllers, both co-op modes and the single versus mode support four- players. And of course, all three modes support online multiplayer as well. Plus, you can mix and match local and online players. Overcooked! 2’s two less robust modes are Arcade and Versus. These allow players to select from a handful of levels drawn from the campaign and then play cooperatively (Arcade) or competitively (Versus). All players get to vote on the level choice, but only a few levels are offered, which is disappointing. On the plus side, players can use emotes to communicate even if they don’t have a microphone. It’s always nice when developers provide voiceless communication options. Arcade and Versus support online matchmaking, but Story does not. You’ll have to invite friends to your in-game party to experience online campaign co-op. Thus, players who don’t know other online Overcooked! 2 players won’t be able to enjoy the meat of the game in co-op. But assuming you have someone to party up with, only the host player gets to select modes or choose to retry levels – not a huge deal. What is a big downer is that inexplicably, only the host player receives Story progress when playing co-op! You can still earn Achievements for playing in a friend’s online campaign, including Achievements for 3-starring sets of levels. But when you start up your own save, none of that progress carries over. Considering how much effort and coordination is required to perfect levels together, it’s frustrating that everyone doesn’t get to retain that progress for themselves. Despite that big issue (which the developers should really fix in an update), Overcooked! 2 is truly a blast to play with friends. You’ll have to think quickly, divide up tasks, and communicate well in order to complete levels with good ratings. My team sometimes failed a level or earned a low score, forcing us to discuss our weaknesses and come up with new strategies for our next attempt. You won’t find many co- op games that require so much coordination, especially not games with as much humor and mass appeal as Overcooked! 2. The Co-Optimus Co-Op Review of Overcooked! 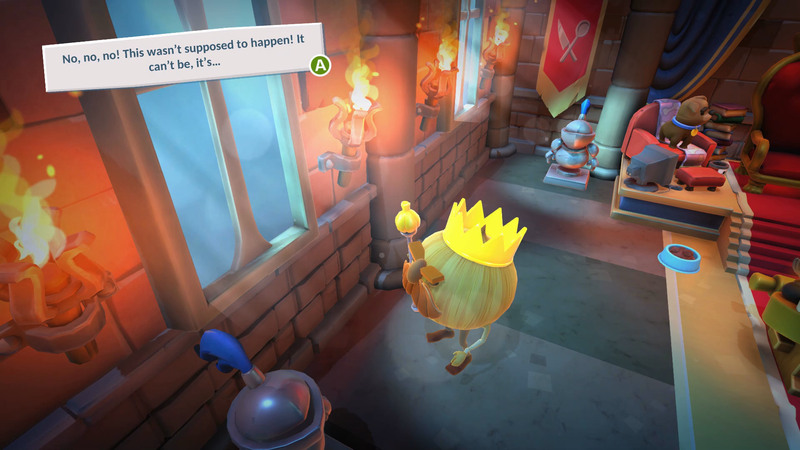 2 is based on the Xbox One version of the game. The Co-Op Experience: Team up with three friends locally, online, via wireless LAN, or a mix of the three (i.e., combo co-op). Work together through all of the story maps as you prepare dishes and try to get a high score! Page created in 0.7540 seconds.